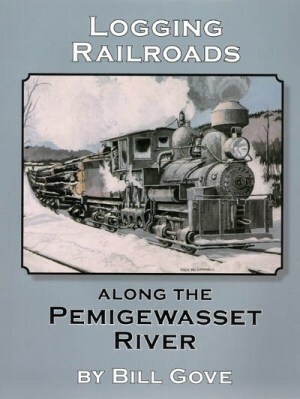 Logging Railroads Along the Pemigewasset River, by Bill Gove, 2006. Bill Gove's latest history covers the logging railroads on the west side of the White Mountains: Gordon Pond Railroad/Johnson Lumber Co., Woodstock & Thornton Gore Railroad/Woodstock Lumber Company, and the Beebe River Railroad from Campton to Flat Mountain Pond. Also covered are the W.D. Veazey sawmill in Woodstock and timber harvests in the Mad River/Waterville Valley area. As always, Gove's book is lavishly illustrated, with over 225 vintage photos. 184 pp., 8" X 10 1/2".